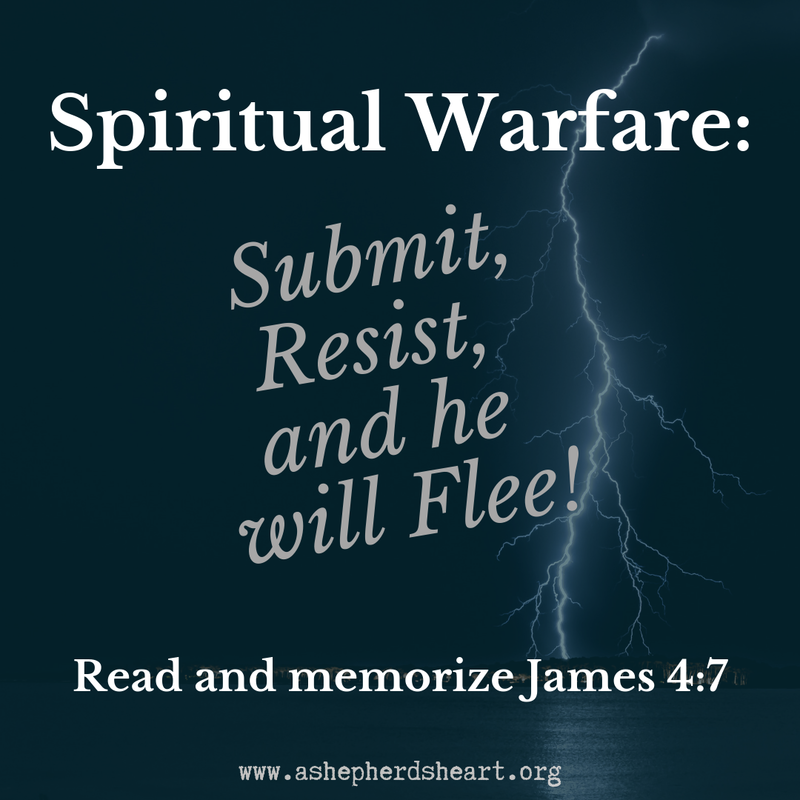 A Shepherd's Heart: Spiritual Warfare: Submit, Resist, and he will Flee! One of the keys in the spiritual battle is having tools to combat the evil one - tools that God has already provided for us such as the primary tools and weapons which are God's Word, Prayer, The Holy Spirit, and The Full Armor of God. We can put on The Full Armor of God through prayer and through His Word we can memorize and have scripture in our hearts when the battle comes at us each day. With this in mind, I wanted to share one verse with you and encourage you to memorize it yourself as an added tool to your spiritual tool belt. It's truly that simple as God defines for us, and note that everything comes back to submitting yourself to God. You can try to resist the evil one on your own but unless you submit to God you will not be successful in doing so. If you abide in Christ, submit yourself to Him, the evil one will have no ground to stand on and he and his demonic influences will not be able influence you because you will be in close fellowship with God. This also assumes that through abiding in Him as you’re in His Word regularly, you’re praying, and in fellowship with other believers. Now, this isn’t some “magic formula” rather; it’s a practical and Biblical way to abide in Him. Now, can you do this and not truly be abiding in Him because you’re essentially “going through the motions”, yes, of course this can be the case, however if you’re intentions are pure, and you’re really seeking Him, then this won’t be the case. 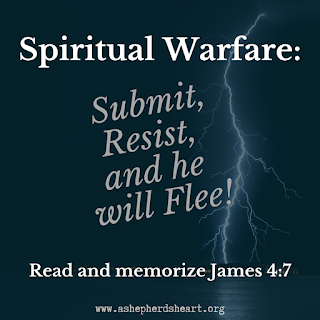 Also, It’s important to note that in this battle that according to the scriptures is not of flesh and blood but of the spiritual realm, (See Ephesians 6) we are not fighting for victory, rather, we’re fighting from Victory as Jesus has already won the battle for us! In sum, Submit to God, Resist the evil one and he will flee! Jesus, The Holy Spirit, Prayer, and The Word of God are the key tools in true spiritual battle. Tools that we should be using day-to-day anyway and when the battles come, and they will, you will be prepared! Let's pray for one another that we'll resist the evil one, abide in Jesus and The Word of God, rely on The Holy Spirit, Pray Hard, and submit to God so that the evil one will flee by the power of God and His Holy Spirit!